Columbian Institute, “Columbian Institute,” Histories of the National Mall, accessed April 23, 2019, http://mallhistory.org/items/show/406. The Columbian Institute was a Washington organization dedicated to the promotion of the arts and sciences for the benefit of the nation. In 1820, two years after their official charter was approved by Congress, the Institute was granted five acres of land on the Mall to create a botanic garden, just west of the Capitol grounds. The plans to follow the garden with a museum and library, described in this article, were never realized. The botanic garden was abandoned by the late 1830s as the organization slowly dissolved. The Medical Heritage Library via the Internet Archive. View original document. 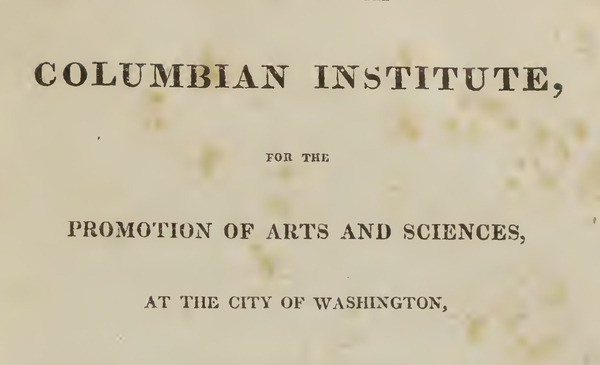 The Columbia Institute was a Washington, DC intellectual society. Founded by Dr. Edward Cutbush in 1816, the main goals of the institute were scientific discovery, historical research, and preservation. Members included many notable Washingtonians, such as senator and President of the United States John Quincy Adams, architects William Thornton, Benjamin Henry Latrobe and James Hoban, and journalist Samuel Harrison Smith.